Design-Build: Develop a set of plans, present the cost of building with those plans, and build the project in-house. Turn-Key Services: Providing in-house, start to finish, construction of a project. A single workforce, with a single vision, with a set of detailed plans. No interruption from one phase of construction to the next, with no need to educate each workforce to the scope of the project or the vision of the complete picture. One in-house workforce experienced at providing unmatched quality while accepting total responsibility for the finished product. In-House: Work that is performed by the company selling the work to you. It also involves insuring all phases of construction through proper workmens compensation insurance. The first requirement for sub-contacting is no control over employees. Our work is scheduled and controlled, with all work performed at our immediate direction. Design: Finding opportunities before investment. Translating a budget to a benefit package within a given work area. Meeting expectations on paper, examining opportunity, and understanding the principles of elevation, scale, and building procedures necessary to complete the proposed project. Investment: Something that stands the test of time. Not only serving the customers' immediate needs, but providing long-term quality and reliability years down the road. High-Pressure Sales: Not in our vocabulary. Take your time. Do your homework. You should expect more from your pool builder than four stakes driven in the ground to locate your pool. The investment you have made in your home deserves more. Be wary of those who want to throw in everything but the kitchen sink just to get you to sign a contract. Landscaping: Working to improve or enhance an outdoor living area with the use of natural and man-made products. Incorporating these materials into our projects through educated and trained employees is the true art of landscaping. In order to design and install landscaping, you have to understand landscaping. We have degreed horticulturalists on staff that understand plant tolerances, species, and selections that work best in this zone climate. How to create visual effects while providing the benefit through color, barrier, shade, and size choices. Award-Winning: When we say "award-winning," we mean that we actually designed the project and built what won the award - not put the pool in and went back two years later and took some pictures, and then sent the pictures to a self-promoting organization with a few hundred dollars. No verification of work performed. Two weeks later, the award is in the mail! 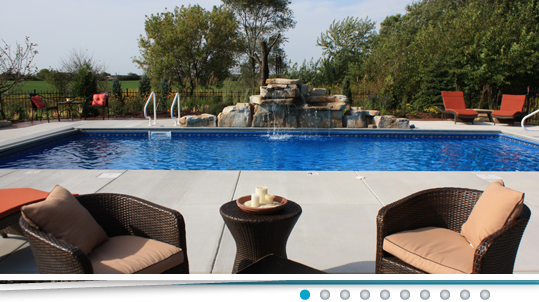 Many of KD Poolscapes' awards have been given to us through the National Association of the Remodeling Industry (NARI). The Milwaukee chapter, the biggest in the country with over 900 members, holds these contests. They are supported by a regional and national contest that involves the seven regions competing on a national level, called the CotY Awards (Contractor of the Year). These entry requirements are much more stringent, demanding start to finish photography, plans, blueprints, permits stating the scope of the work performed, along with signed contracts showing the contractor applying is the one named. These entries are judged by industry professionals in another chapter. For example, Milwaukee chapter entries are judged by the chapter in Minnesota. They are graded by a panel of judges and are given a ten point grade on nine different parts of the project. We are proud to say our commitment to the industry is demonstrated through awards being received for our projects every year since 1989. As the most award-winning NARI member outdoor living contractor in the state of Wisconsin, we have also been recognized by the Wisconsin Ready Mixed Concrete Association for our concrete work. We were the National Contractor of the Year in 1995 and have also received three regional awards. The trouble with awards is that they are always something that you did or were supposed to have done. These awards are yesterday's news - but at least you can see where we were yesterday! And we really were there. Hydraulics: Our systems are designed with 2 inch plumbing throughout application. Almost every pump, filter, heater, and chlorine generator is, too. Under-sizing of pipe, even if it's hidden underground, compromises everything from flow rate to efficiencies in pump, filter, and heater. Our pools feature dual main drains, dual skimmers, and a minimum of three return lines, plus high-quality Spears, PVC fittings, and pipe. We use Spears, Jandy, and Sta-Rite high-quality 2 inch, 3-way and 2-way flow and directional valves. Innovation: Bringing new ideas to an existing benefit. Taking something that's good and making it better. Bringing new products and services to market that benefit the quality of living for your customer, their families, and their friends. Grading: The marrying of the hardscape to the softscape. Blending the contours of the project so they not only provide a natural look but also give us the drainage result that serves the landscape. Backfill: This is the material used around the perimeter and in the French drain systems used around the pool. We use a number one wash round stone. This provides an excellent drainage media for collecting water around the pool and pumping it away. This is how almost all houses are set up. Drain tile around the house is directed to a sump and pumped away from the foundation. It is also a very clean backfill that is very stable. Rather than expanding soils, this base provides excellent stability. It also makes it impossible for rodents to eat or destroy the plumbing. Traffic bond and clay backfill absorb moisture and expand in winter. These pressures are what crack and heave concrete. No backfill is made to support your decking system around the pool. We use our backfill as a drain support and concrete footings to hold our decks up and avoid settling issues altogether. Deck Supports: These are steel trusses that support the first three feet of decking around the pool. They are tied into the steel walls and allow the deck to be poured on top of the 6 inch pool wall. This wall is 46.5 inches deep and is poured into a 3' x 1' concrete footing. This system is also much like the one used in home construction. These supports transfer the stability of the walls to the first three feet of deck. This will prevent any settling around the immediate pool area. What about the rest of the decking? What happens when the area under the decking starts to settle? The concrete will crack and pull away from the coping. Do you think this will affect the plumbing? Have you ever noticed that on almost every pool you see, the skimmers have been replaced? You guessed it; the deck moved and cracked the skimmer and/or broke a line. Our 25-year proven deck support systems have provided our customers with years of service with no visible settling. That's right; we have never replaced a skimmer, line or piece of decking! Our system works.